This entry was posted on March 31, 2018 by Anbritt. Arnold Palmer is perhaps the most recognizable golf name in the history of the sport and one of the greatest golfers of all time. I recently watched In Depth with Graham Bensinger’s tribute to Arnold Palmer and I was inspired by Arnold’s lifetime of career achievements, his dedication to his community, and the passion of his fans forever known as “Arnie’s Army”. The episode of In Depth is a must-see for golf fans highlighting Arnie’s incredible career, all the wins on the Tour, and the iconic Masters Tournament moments. It also defines how he is the grandfather of modern sports marketing and golf fandom. Sure there were passionate golf fans before Arnold Palmer. But did anyone have his own Army of fans? Photo source Ricky Lee Potts. Unbelievably, Arnie never personally founded Arnie’s Army. In 1959, television was becoming a part of every American household and golf was being broadcasted more than it ever had been before. The tickets to the Masters that year were sold for $5 a piece, and still the tournament organizers couldn’t sell it out. That year, The Masters was to be televised for only the second time in tournament history. The co-founder of the tournament, Clifford Roberts, was nervous that the Augusta National galleries would look empty on TV so he decided to give any GI that showed up wearing a uniform a free ticket. It worked. The GI’s didn’t know much about golf, so they began following the reigning champion of the tournament – Arnold Palmer. 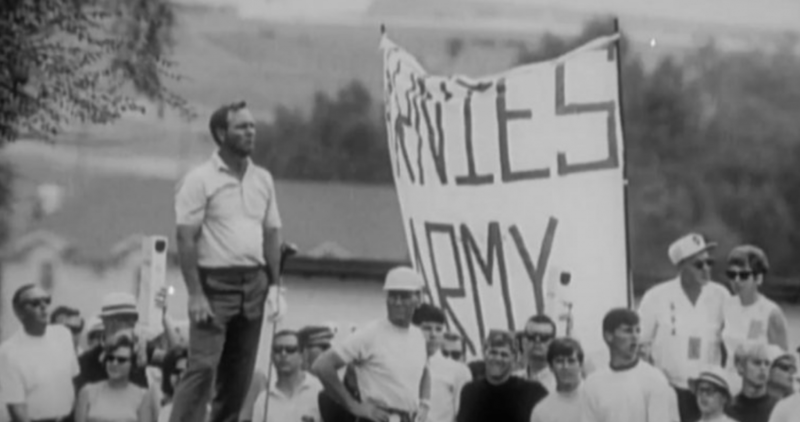 By the time Arnie and the Army GI’s got to the back nine, reporters began to identify the group as an Army of Arnie fans. The headline in the Augusta Chronicle the next day read “Arnie’s Army” and so it began. 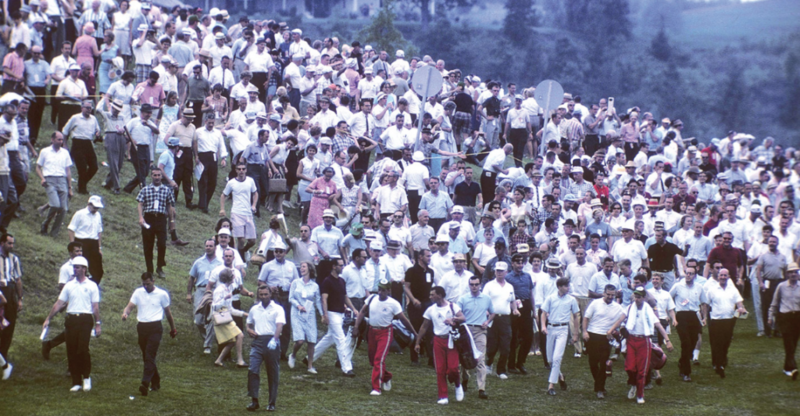 From that moment on, fans flocked to Palmer throughout his tournament stops for years and decades to come. Arnold Palmer credits his Army with giving him momentum and confidence to win many tournaments when he was trailing or not playing well. Their support willed him through injuries and fatigue during rough times of his career. This legendary photo of Nicklaus and Palmer appeared in Life Magazine. 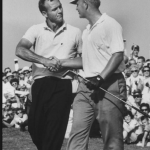 Despite the attention and never ending popularity, Arnie was consistently admired by his peers and competitors as a loyal friend and gracious champion. Arnold Palmer passed away in September 2016. 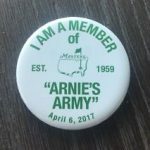 As I walked into Augusta National for the 2017 Masters Tournament, I was approached by a young person holding a handful of buttons. They read: I Am A Member of Arnie’s Army. Est. 1959. With the date printed of April 6, 2017. It brought a special feeling to that day on the course. As I made my way to the galleries, I realized there were literally thousands of people wearing the same button. Throughout the tournament, additional buttons appeared. Locals dug out their old buttons and fans began wearing multiple buttons on their jackets. The Army lived on! And Arnold Palmer insured his Army would continue after his passing, focusing on the priorities during his incredible lifetime career. Today the Arnie’s Army Charitable Foundation continues to support multiple family and community causes around the world.